The color purple is a eggplant I love. Caution this is not the sheet set for summer temps, the blend is better suited for cold nights. 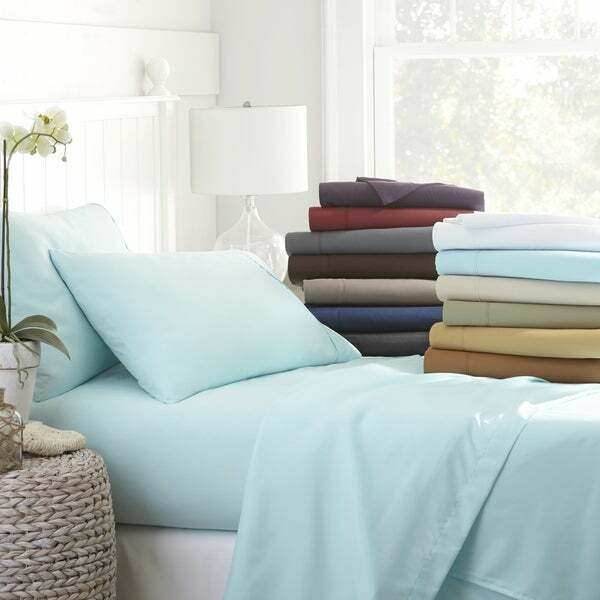 Slip into a peaceful slumber with this cozy and buttery-soft microfiber sheet set. Made from 100-percent polyester microfiber, these solid sheets are offered in a variety of bold or classic color options. Dimensions 10.0 In. X 4.0 In. X 10.0 In. Dollar for dollar this is the best deal on sheets I have found. My husband said they are the softest sheets hes ever slept on. I love them too but they are more of a cold weather sheet, they do retain a bit of body heat. I will leave them on the bed this summer because I love how soft they are but if you get hot when you sleep perhaps these are not made for you! Very soft and comfortable, fits a 14 inch mattress. Sheets are very soft and fit our 14 inch mattress nicely. We were a little skeptical ordering these sheets because someone remarked that they "held the heat" and were a bit warmer than other sheets. We have a Tempurpedic bed and the memory foam already holds heat so we were worried. But we've been very pleased. These sheets feel like your favorite TShirt and are cooler than the traditional cotton sheets of comparable threadcount/quality. We didn't have to go through the obligatatory "breaking in phase" of some of the cotton sheets we've had in the past where the 1000 threadcount sheets are stiff and scratchy to begin with until you launder them several times. These were exactly right as soon as we put them on our bed! I will definitely order more if/when we need another set. Very soft. Easily fits my 18 inch mattress. It would be perfect but I have an additional 2 inch topper, so the fitted sheet will sometimes ride up in 1 corner. Not the sheets fault but would recommend for standard sizes, nothing over 12inch mattrees. Yes the sheets are ultra soft but I’m very disappointed in the size. I ordered king and the fitted sheet does not tuck under our 14 inch mattress enough to stay put. The top sheet is barely wide enough to cover the fitted sheet. If anyone orders these make sure your mattress is no more than 12 inches deep. Very soft sheets and accurate size. I have a 14 inch mattress and they stay on the bed pretty well. these sheets were so soft and comfortable. I have washed them and they came out as nice as before. I ordered King sized, and they fit my 12 inch depth mattress , love them! Please be clear that these are NOT 100% cotton sheets, or cotton of any kind, for that matter. These are microfiber sheets and I would normally avoid such a fabric, however, these are exceptionally soft, warm, and well-made. Lovely color (eggplant) The sheets are so soft and comfortable. I'm always skeptical about sheets that I can' feel before I buy but I read the reviews and took a chance, they are fantastic! Very nice sheets for the price. Deep pocket, (15"), fits nicely over matress, cover AND down feather bed. Was concerned about that, but am very pleased. Cool, comfortable and good looking! These sheets were just something I ordered to put on an aerobed- inexpensive and I didn't expect much beyond being functional. These sheets are great! Don't be fooled by the low price! They looked great and fit great, were comfortable to sleep on and washed up softer than before. Instead of being the extra sheets for travelers they became my everyday sheets! Good buy!! I needed fresh sheets and the description/price fit the bill. I read the past reviews which were basically positive (no pilling, etc.) so I was comfortable with placing the order. I did not open the sheets for several weeks. I put them on my bed a few days ago and as I was pulling on the fitted sheet the skimpy elastic snapped. Mind you, I was not tugging at the sheet in any unusual way. I found the elastic thin (about 1/4 inch wide perhaps?) and not even attached to the sheet but simply sliding around. I have the sheets on the bed and am not interested in the hassle of repackaging them for a return...but be forewarned. Absolutely love these sheets, super soft. These sheets are worth every penny! I'm impressed with how well they wear and wash. I wasn't expecting such high quality for the price now I'm sad I didn't order more. Super soft and luxurious! The color is vibrant. Quality of these sheets is very nice. I really like soft they are. They fit my adjustable bed perfectly and have ample depth to accommodate the mattress. We have a king adjustable, so I order 2 twin XL's and then just sew the two top sheets together so each mattress can raise and lower separately, but we have one large top sheet. Work perfectly for us. Really nice, soft sheets. Wash well. Pleased with these. Not bad for the price. It is soft. Soft. Do not wrinkle love these sheets. Would buy again. Wish the set came with 4 pillow cases. Nice and soft and does not wrinkle ..
"Can you purchase extra pillow cases"
Unfortunately, we do not currently carry additional pillowcases for this set. "Does these fit king size bed with the matters 22 inches corners"
"Is their any warranty with it ?" No, there is no warranty on these. "I have an antique 3/4 size bed. Would the extra large twins fit it. I am looking for a mattress so I don't know the actual size yet. " I am not sure. I have a queen size bed. I would think a full size would fit better and the xl twin it think, are usually longer than the average. I use the XL twin sheets for my husbands hospital bed. They are a perfect fit. I hope this helps you. Antique beds usually are built for full/double size mattresses. You should be able to eliminate the twin size just by looking at the headboard. "Is the "burgundy" really a dark red color? In the photo it appears to be a washed out orangish-red, but I am looking for a true burgundy/dark red"
It is a Burgandry color. I odered them and they are beautiful!! No, they are not flannel. "Do they pill at all?" No and so comfy. Wash well too! I’ve purchased several sets and never had a problem with pilling. These are very soft and comfortable!